Nestled a stone's throw away from the Russian River in Sonoma County, Big Bottom Market (www.bigbottommarket.com) opened four years ago in a small town on the verge of a renaissance. 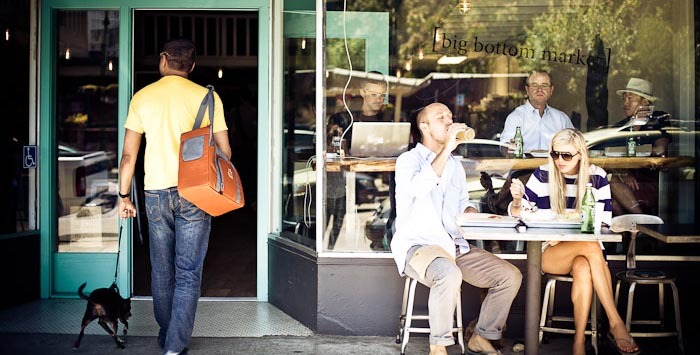 While the fanfare around the opening of the artisanal foods purveyor drove foot traffic, the owners knew that the seasonal visitors would soon disappear and that marketing the gourmet establishment to local residents and establishing an e-commerce storefront would be paramount in the winter months. For a few years the team used Facebook to announce daily specials and a fishbowl next to the register to collect email addresses. While these helped maintain awareness with loyal customers, finding affordable marketing tactics to build the customer base alluded the team. For the 2014 holiday season the team tested Google AdWords. Starting in October they planned for a November campaign launch, but the challenges associated with getting up and running with AdWords pushed the campaign launch to December. They settled on a budget of 50 dollars a day and focused on marketing their locally-sourced gift boxes. The campaign resulted in zero purchases and they spent a little over 500 dollars for "clicks", a hefty sum for a small business in the off season. In addition to spending money on AdWords, they also paid an HTML expert to re-code their e-commerce site and they stocked up on inventory in anticipation of a big uptick in sales -- two expenses they hoped would be recouped with a big uptick in holiday gift sales that did not result. After the not-so-successful gift box campaign, the team needed to find a more affordable and ROI driven way to drive new customers into both the actual Market and the e-commerce offering. While researching marketing technology solutions for small businesses, Kerry Hyatt, Big Bottom Market's general manager, discovered Opt-Intelligence, an email list growth provider that offers a simple programmatic ad buying solution for small businesses. The company's small business solution, LeadServe, integrates with most of the small business email marketing platforms including MailChimp, Constant Contact, Demandforce, iContact, Infusionsoft and many others. LeadServe makes it easy for business owners to create their own "opt-in ads" and target valuable consumers for their product or service. The opt-in ad presents the consumer with an option to learn more about the business and asks for the consumer's email address. When a consumer asks to learn more about the business and shares her email address, that email address is routed automatically to the business's email list wherever that list is located -- for example in MailChimp or Constant Contact -- and LeadServe sends a welcome email to the consumer on the business's behalf. "We were literally able to create an ad and target local consumers within five minutes. All I did was write a couple of sentences inviting consumers to sign up for Big Bottom Market email, define my audience - men and women ages 21-55 - pick nearby towns from a drop down menu and define my daily budget. We settled on $15 a day and the system automatically created the ad and served it to top tier publishers. It was that easy." When Big Bottom Market signed on with LeadServe they had only 50 customers on their email list. In less than a month that number went from 50 to more than 400, and now Big Bottom Market has thousands of email subscribers. Their cost per lead has been $1.15 on average. The team started with an opt-in ad campaign targeting nearby residents. 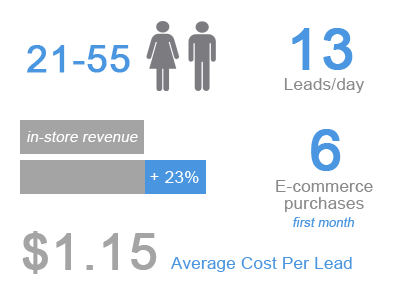 They sent emails to these new subscribers featuring in-store promotions and found particular success driving traffic to their Friday and Saturday happy hour. Being located in wine country is also helpful in promotion development. During Barrel Tasting Weekend they sent out a localized email offering 10% off any purchase in the store, which resulted in more traffic and 23% higher year-over-year revenue numbers for the two weekends that the promotion ran. The success of the LeadServe program prompted Kerry's team to launch a local campaign focused on the Market's new catering business and a national campaign for the e-commerce business. In just the first month, the catering campaign resulted in 23 email leads and 8 customer orders. In the first month of the e-commerce campaign, Big Bottom Market grew their national email list by more than 50 subscribers, and 6 of these had already made purchases. "It is great when someone comes in and flashes their phone at the register showing us that they were driven to the Market by the email we sent," said Kerry. "Frankly, that never happened before we found LeadServe. We like the opt-in concept because it creates more of a one on one conversation with people that actually want to hear from us. Our name also helps. Who wouldn't open an email with 'Big Bottom' in the subject line?" Heidi Schulte believes that every person deserves the most beautiful skin possible. In the small town that she lives in there were no skincare businesses offering a full range of waxing and facial services. People had to drive up to 30 minutes for an experienced skincare professional. With experience as a skincare specialist and makeup artist at top cosmetic companies, Heidi opened June Bug Skincare three years ago. From waxing to facials, Heidi has a precise touch and a keen dedication to providing superior skincare services to men and women, helping clients achieve their smoothest and healthiest skin. Heidi was smart and rented space in an existing beauty salon in town that only offered hair and nail services. She thought that the installed base of customers at the salon would help to grow her client list very quickly, and she was right. Within a few months she had a steady stream of new and repeat clients. She collected email addresses for many of these clients. She also built a Facebook Fan Page and used both email and social media to promote specials and new service offerings. Then one day she found out that the salon would be closing. She quickly found a new space right in town but realized that she would need to augment new client acquisition, because she would be losing the steady stream of men and women coming into the salon. Heidi already had a great reputation. Word of mouth about her professionalism and expertise traveled quickly around town. But she wanted to further grow her business and affordably market her services in other nearby towns. Heidi's town is also a tourist destination, and while the town gets many visitors it also has busy and slow seasons. Just about every business in town is affected by the ebb and flow of tourists, and marketing to locals is a must. Having experienced success in the past sending promotions to her email list, a friend recommended that Heidi use Opt-Intelligence to grow her list. Opt-Intelligence is an email list growth provider that offers LeadServe, a simple programmatic ad buying solution for small businesses. LeadServe integrates with most of the small business email marketing platforms including MailChimp, Constant Contact, Demandforce, iContact, Infusionsoft and many others. LeadServe makes it easy for business owners to create their own "opt-in ads" and target valuable consumers for their product or service. The opt-in ad invites the consumer to learn more about the business by signing up for the business's email list. When a consumer asks to learn more about the business and shares her email address, that email address is routed automatically to the business's email list wherever that list is located -- for example in MailChimp or Constant Contact -- and LeadServe sends a welcome email to the consumer on the business's behalf. "My business was solid, but I really wanted to jump start growth and move beyond word of mouth," said Heidi. "I had seen good results from emailing my loyal customer list, but I didn't realize there was a way to invite new customers to join my list until I discovered LeadServe." There are so many little towns in this area that lack 'bigger city' service offerings like mine, and there are lots of men and women who will travel for expert skincare. With LeadServe I easily created a list growth ad campaign and used the zip code targeting tool to target new customers. Having driven 20 miles for waxing and facials in the past, I used my own experience to set a 20-mile targeting radius around my zip code in LeadServe." Heidi started out with an email list of almost 500 customers. Within a month of launching her first LeadServe campaign her list grew by 24%. She continues to add subscribers steadily every month. She was able to set a daily budget at a rate that was affordable for her, and she can change her budget whenever she wants. Her cost per new email lead is only $1.25, and once she reaches her daily budget LeadServe automatically stops serving her ad. Because she is primarily searching for new female clients, Heidi defined her target audience as nearby women ages 18-55. LeadServe uses proprietary ad technology to serve June Bug's opt-in ads only to local women in Heidi's target demographic, on sites and apps that include female focused content as well as lifestyle and local news outlets. LeadServe also automatically sends out a 'thank you' email to June Bug's new email subscribers offering 50% off of their first facial. "With LeadServe my email list started growing immediately at a cost that made sense for my small business. I am seeing more new faces than ever come through my door. LeadServe is working for me and I would highly recommend it to any small business in need of an affordable, easy marketing solution." Located in Queens, NY, Monkey Fist Martial Arts offers classes in martial arts, fitness kickboxing, and programs for kids such as birthday parties, after school classes and a unique summer camp. Sensei Fred Marino has been involved with martial arts since 1992. He began his training under Shidoshi Louis Hurtado and received his 1st Degree Black Belt. He then began training under Sifu Charles Chi, earning ranks in Wing Chun Kung Fu, Filipino martial arts, Penjack Silat, Jun Fan Kickboxing/Jeet Kune Do, Kyokushin Kai Karate, Brazilian Jiu Jitsu, Muay Thai and boxing. Fred opened Monkey Fist Martial Arts in 2013 and quickly learned that Queens is a competitive town in the martial arts world. There are eight different martial arts studios within a five-mile radius of Monkey Fist, and this doesn't include the Crossfit outlets, personal trainers and branded gyms that also offer unique fitness programs. Breaking through all of the noise - and often deeper marketing pockets from larger gyms - can be a challenge. Fred needed an affordable and automated way to discover potential students living close by with an interest in martial arts and his other fitness programs. For the two years that Fred has been in business he has enjoyed steady growth, mainly from word of mouth referrals, and he wanted to see if there were other ways to attract even more new students. Once they get in the door, Fred's students tend to exhibit strong loyalty. Finding those students through marketing efforts, however, is the challenge. Fred discovered the LeadServe solution from Opt-Intelligence and quickly set up an account. "We only pay when someone actually signs up for email from Monkey Fist. There's nothing else like LeadServe for generating email leads," said Fred. I found it very easy to create my own ad and target new customers. 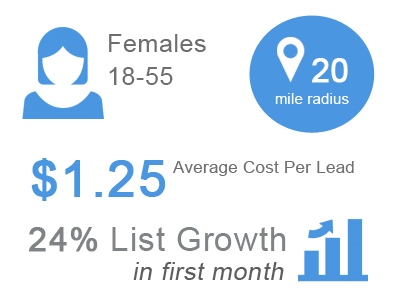 The zip code radius feature allowed me to enter in my zip code and target potential customers within a 10 mile radius." Fred was "pleasantly surprised" when his LeadServe campaign launched with an average of three leads a day. 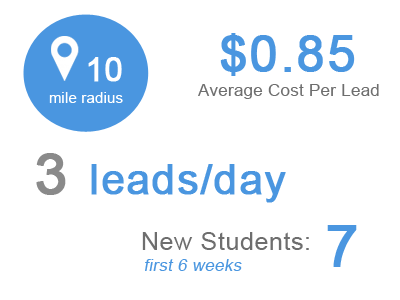 "It's not just the number of leads I'm getting, it's the quality. This is generating more high quality leads than I ever got using Facebook, Google and other pay per click marketing solutions." Within six weeks Fred already had seven new students who learned about Monkey Fist through LeadServe ads. Six of the seven converted into longer-term students after taking discounted trial classes, purchasing packages that range between $125 and $149. Fred says, "We tried a lot of things before we found LeadServe. This is the kind of return we were looking for. We are not a huge operation, but we are planning on continued growth with the help of LeadServe." Traditions 118 (www.traditions118restaurant.com) is a family owned restaurant located in Granite Springs, New York, that offers time-honored classic cuisine with a contemporary flair from an award-winning chef. Mike Lubic and his family established the business in 2004 and have worked hard building a valued base of repeat customers. As is the case with any business in a growing community Traditions 118 was facing competition from new restaurants and larger scale chains with massive marketing budgets. Mike and his family wanted to continue to increase traffic to their establishment, encouraging regulars to visit more often while building a base of newer customers. Mike had been using email as a way to reach out to loyal customers, offering coupons and other deals to entice customers to visit frequently. The program was working, but it was not bringing new customers to the restaurant. And as is the case with any email list, churn was becoming an issue; his list was slowly shrinking as customers moved away or switched email accounts. Mike's goal was to generate 100 new email subscribers per month for the Traditions 118 weekly newsletter. He wanted email to become a way to add new customers to the restaurant, and not just a way to send coupons to existing customers. Mike also wanted subscribers to reside near the restaurant and be added automatically to his account with Constant Contact, a Web-based email management provider for small businesses. However, collecting business cards in a fishbowl at the front of the restaurant was not keeping up with the loss of list members, and it was not bringing new customers through the door..
Mike and his team decided to turn to LeadServe from Opt-Intelligence to help solve his email churn and lead generation problems. LeadServe enabled Traditions 118 to create online advertising units that invite targeted website and mobile app users to sign up and receive email messages. Ads are placed on relevant publisher sites and visitors accept an invitation to opt-in for emails from Traditions 118 by making a selection right in the ad unit. The sign-up ads are only shown to people within 15 miles of the restaurant. The results have been outstanding. 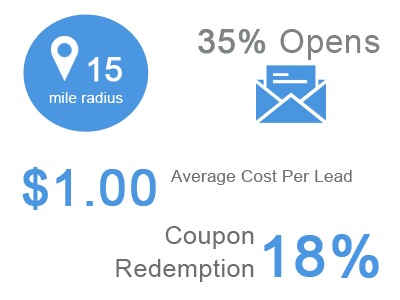 Since March 2014, LeadServe has been fulfilling the monthly cap of 100 new local email sign-ups. Not only are Traditions 118 devotees signing up with LeadServe ads, but the program is bringing all sorts of customers to the restaurant for the first time. The open rate on the auto-responder email that is sent out via LeadServe is approximately 35%, and the new subscribers are opening and clicking on subsequent emails at a higher rate than in-restaurant sign-ups. More than 18% of new subscribers have redeemed the first coupon sent by LeadServe. As a small business, cost was also an issue. Mike is only spending about $1 to acquire each new email subscriber and for Traditions 118 the value of each new customer is approximated to be $75.